MILWAUKEE, Oct. 18, 2018 (GLOBE NEWSWIRE) -- Koss® Corporation (NASDAQ Symbol: KOSS), the U.S. based high-fidelity Stereophone manufacturer and inventor of the world’s first SP3 Stereophone in 1958, announced the release of three new Koss Wireless Bluetooth® headphones. 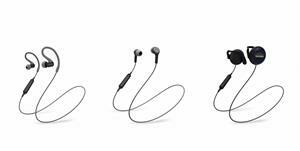 “Today we’re excited to announce the addition of not one, but three new Koss Wireless Bluetooth® headphones to our rapidly expanding line-up of Wireless Bluetooth® headphones,” said Michael J. Koss, Chairman & CEO of Koss Corporation. The Koss BT232i Wireless Bluetooth® FitClips, Koss BT115i Wireless Bluetooth® In-Ear Buds, and Koss BT221i Wireless Bluetooth® Ear Clips all feature intuitive, in-line controls* that allow listeners to quickly navigate through songs, play or pause music, volume-up and volume-down; listeners can also stay connected using the in-line microphone to easily answer incoming calls. All three new Koss Wireless Bluetooth® headphones have Wireless Bluetooth® version 4.2 with a rechargeable battery that lasts up to six-hours on a single charge. The Koss BT232i Wireless Bluetooth® FitClips utilize an original design that locks in the fit for sports and active use. Wireless Bluetooth® sound is comfortably delivered to the listeners ears using a ported, isolating design. The Koss BT232i Wireless Bluetooth® FitClips are sweat resistant, include a cable management clip and three cushion sizes for the perfect fit. The Koss BT115i Wireless Bluetooth® In-Ear Buds feature an original ergonomic design to create the perfect seal, fit and sound. The Koss BT115i Wireless Bluetooth® In-Ear Buds include a cable management clip and three cushion sizes for the perfect fit. The Koss BT221i Wireless Bluetooth® Ear Clips have a unique pivoting clip which allows them to comfortably rest on the ear for extended listening. The non-isolating, open design of the Koss BT221i Wireless Bluetooth® Ear Clips enable listeners to enjoy their favorite music while remaining aware of their surroundings. The Koss BT221i Wireless Bluetooth® Ear Clips include a cable management clip for optimum fit on the go. Koss® markets a complete line of high-fidelity headphones, wireless Bluetooth® headphones, wireless Bluetooth® speakers, computer headsets, telecommunications headsets, active noise canceling headphones, and compact disc recordings of American Symphony Orchestras on the Koss Classics® label. For more information, follow Koss on Instagram @Koss, Twitter @KossHeadphones, on Facebook at Facebook.com/Koss, or at Koss.com. The Bluetooth® word mark is a registered trademark owned by Bluetooth SIG, Inc. and any use of such mark by Koss® Corporation is under license.